A quick guide to capture images of a waterfall, a closer look to understand the specifics of capturing these universally loved natural phenomena with their dynamic textures and lush backgrounds, as well as decoding the challenge of capturing the magnetism of the moving water on the lens. Waterfalls are some of the most beautiful natural features to capture on camera. From the meandering flow of the water across rocks to the splash and spray of a crashing torrent, they can provide a number of moods, styles and options for landscape photography. At the same time, they also present a number of practical and technical challenges, which can make them difficult to shoot. EQUIPMENT: Two important pieces of equipment which one must carry with a camera are a tripod and a circular polariser. 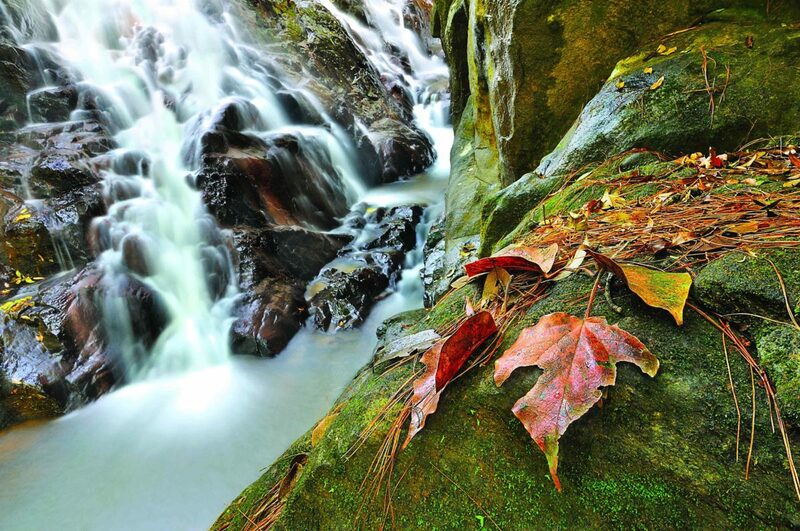 ND (neutral density) filters can also be used in situations where the scene is too bright to get an exposure long enough to blur the flowing water. 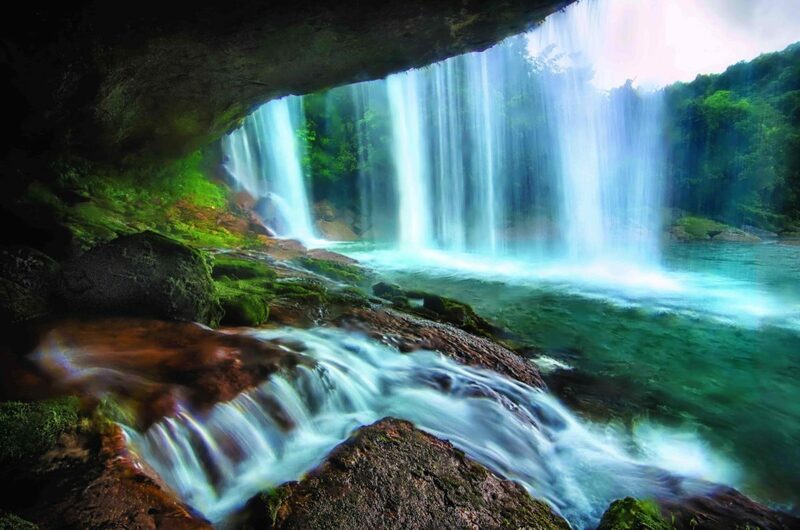 Camera – Any camera that is capable of capturing at shutter speeds longer than one second and preferably upwards of 15-30 seconds can be used to click waterfall photos. All digital SLR cameras come with this functionality and few point and shoot cameras also now provide some long shutter speed functionality. Polariser – Though waterfalls can be photographed without a circular polariser, but I would not leave to shoot waterfalls without it. It is an indispensable part of my waterfall photography equipment. Coupled with the effect of the filter it also cuts 2 stops of light, which is beneficial for a longer exposure. Tripod – Using a tripod is essential for waterfall photography as it allows you to capture water movement and at the same time retaining the sharpness in the image when the camera is operated at slow shutter speeds. Without a tripod, the results will be blurred images when we are shooting at longer exposures. HOW TO PHOTOGRAPH WATERFALLS: Using slow shutter speeds will help in achieving the desirable smooth look to the flowing water. Shutter speed is the time for which the shutter of the camera remains open to allow light to enter and varying the shutter speed will render different feels to the flowing water by blurring the flow in different amounts. Longer shutter speeds can be achieved by using a low ISO setting, shooting at relatively high f-stop (f 16-22) or by introducing filters such as ND filters or circular polarisers. Shutter speeds of about 1/2 – 1/8 sec render the dynamic and fast flow of the water beautifully, while a 2 – 30 sec shutter speed will make the water look silky smooth. The selection of the shutter speed will depend on your taste. Personally, I try to hover around the 1/2 – 1/8 sec mark which portrays the water in a way in which some texture of the dynamic flow is retained, but you also get the smooth look to a certain extent. » Set up the camera for the photo, composing with an interesting foreground element. Normally I look for a rock and focus the camera on that while retaining the background in focus also. This is how I like to compose my landscape photos also, but I don’t restrict myself to this technique always. » Put the camera in Aperture Priority mode and set the camera to a relatively high f-stop around f 11-22). » Fire a test shot to get a basic feel of what exposure times you will be working with. » If there is a breeze, it will affect the sharpness of the foliage in the surrounding area. Then it is best to opt for a shutter speed that isn’t too slow. » When I feel the need to increase the shutter speed for a longer exposure, I simultaneously increase the f-stop too, which give me a more ideal exposure time. » Aperture Priority works for me, but using Manual mode will also yield the same results and I sometimes change to Manual mode myself to get the desired results. Use whatever works best for you; the mode doesn’t matter, the end result must be as desired by you. Ideal weather conditions: Miserable and extreme weather conditions are the best time to make great waterfall images. Overcast skies offer a lovely diffused light and the rain increases the flow of the water. But remember to keep lots of plastic bags in your camera bag to protect your gear from rain and spray water. What a wonderful place to visit. 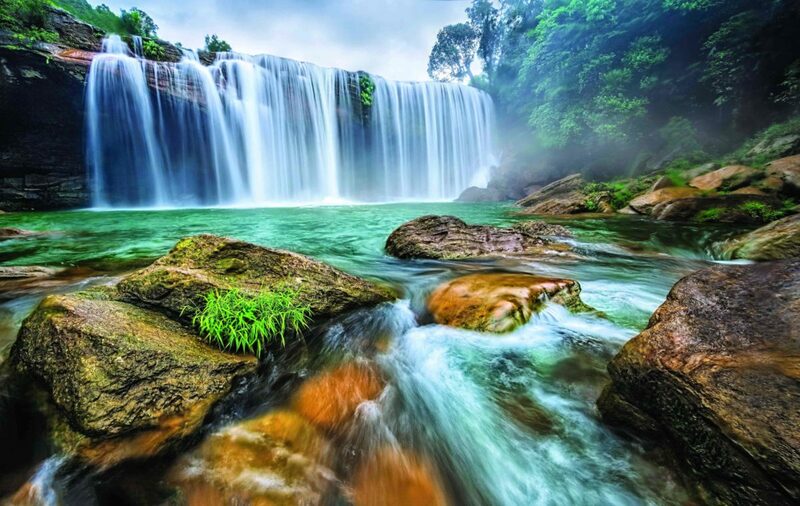 Waterfalls are some of the most beautiful natural features. Thanks.